You are currently browsing the tag archive for the ‘trenches’ tag. War has broken out. This leads to a surprisingly cheerful crowd of people happily volunteering to be a soldier. As if The Great War had never happened. Oswald volunteers too, after a long goodbye to his girlfriend. In the trenches, he’s still kissing her portrait, until it is bombed by a mouse. This leads to an air battle between Oswald and the little rodent, which ends with Oswald beating up the mice, until he’s confronted by an angry officer. 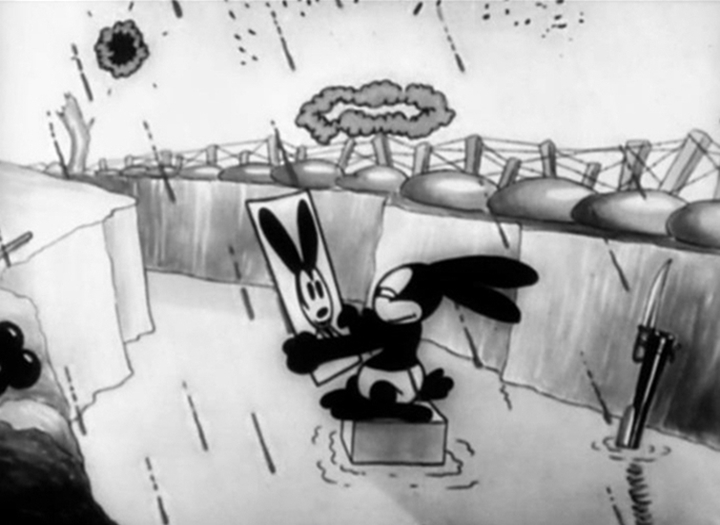 Oswald and the officer get into a bombing duel, in which Oswald uses an elephant, which explodes. In the end even Oswald himself is literally blown to pieces, but he’s revived by his girlfriend who’s a red cross nurse. The depiction of war in this cartoon is surprisingly positive, and there are a lot of gags. Real danger is never felt, but the cartoon does feature some startling images of huge cannons swooping into the camera. Four years later Hugh Harman, who did some of the animation, would reuse elements of ‘Great Guns’ in his own World War I film ‘Bosko the Doughboy‘ (1931).